THE EVP THAT PLAYS WHEN YOU OPEN THIS PAGE, IS SAYING "MORGAN'S COMING" OR MORE OF THEM COMING, EITHER WAY IT IS ONE OF THE FIRST ONES I GOT AN WAS NEAR THE CABIN. WE GOT WAY TOO MANY EVPS TO PUT UP ON THE SITE. WE WILL ADD/CHANGE THEM AS WE CAN. THANKS FOR YOUR SUPPORT. GO TO www.redmill.org TO GIVE TODAY! WE NEED TO SAVE HISTORY AND YOU CAN HELP! THIS BED LOOKS SHORT AND IT IS! BRUCE LET US IN ON A SECRET. BACK IN THE DAY, THEY SLEPT SITTING UP!!! NO KIDDING, I DID NOT KNOW THAT EITHER! FREAKS ME OUT, BUT THEN I REMEMBERED THAT LILLY AND HERMAN DID TOO ON THE MUNSTERS, SO I GUESS IT IS TRUE. SUPPORT HISTORIC SITES LIKE THE RED MILL MUSEUM, DONATE TODAY, YOU WILL BE HELPING PRESERVE HISTORY FOR FUTURE GENERATIONS TO ENJOY. 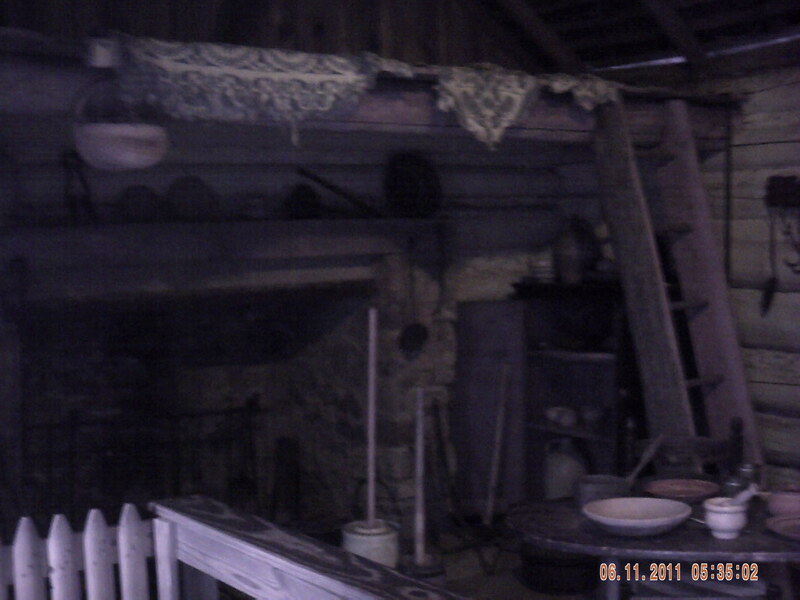 THIS IS THE INSIDE OF THE BLACKSMITH SHOP. I LEFT A TRI-FIELD METER HERE WITH A VIDEO CAMERA AND THE THING WENT NUTS. ALTHOUGH I GOT A NICE CLASS A EVP ON THE CAMERA; "CLINTON", I SAW NO OTHER ANAMOLIES THAT WERE OF SIGNIFICANCE, YET THE PLACE IS VERY HEAVY. THIS HAS TO BE CHECKED OUT MORE! IN THE BOTTOM OF THE OLD MILL, IS A GIFT SHOP. THAT IS WHERE DOUG AND I SET UP OUR COMMAND CENTER. THEN IT WAS OFF TO DO A BASELINE SWEEP. WE BOTH WOUND UP GETTING EVPS AND THIS IS 4PM OR SO IN THE AFTERNOON, I KNEW THIS WOULD BE A GOOD INVESTIGATION! JUST ONE OF THE 10 BUILDINGS, THIS OLD BREAKER WAS USED TO CRUSH ROCKS AND WAS DRIVEN BY A STEAM ENGINE. The inside of the one-room schoolhouse is a sight for the eyes! It looks as if the students had just left and would be back at any moment. This is a real treasure to behold and even more to touch! History comes alive here as you try to understand how they lived and learned back then. The Bunker Hill School House is also the home of at least one former student, a girl named Sila. That night she even used the dowsing rods to point to her picture on a wall. THE GIFT SHOP IS ON THE BOTTOM FLOOR OF THE MILL, WHERE YEARS AGO, WAGONS WOULD PULL IN DIRECTLY UNDERNEATH WHERE THE GIFT SHOP IS TODAY AND DRIVE OUT THE OTHER SIDE! THese are the Lime Kilns. There were Lime Kilns here as early as 1758. WHen lime is fired, the reslutling compound creates a powder that was used in Talcom Powder, and sanitation. ONE ROOM SCHOOLHOUSE ON THE RED MILL MUSEUM PROPERTY, WAS MOVED THERE ON A TRUCK. A WOMAN WHO TAUGHT AT THE SCHOOL, WALKED BEHIND IT AND PICKED UP PIECES SO THEY COULD STAY TOGETHER. DOUG AND I SET UP EVP RECORDERS IN THERE AND LATER WE WOULD HAVE THE WHOLE GANG IN THERE TALKING TO A GIRL WHO WENT TO SCHOOL IN THAT SCHOOL HOUSE. 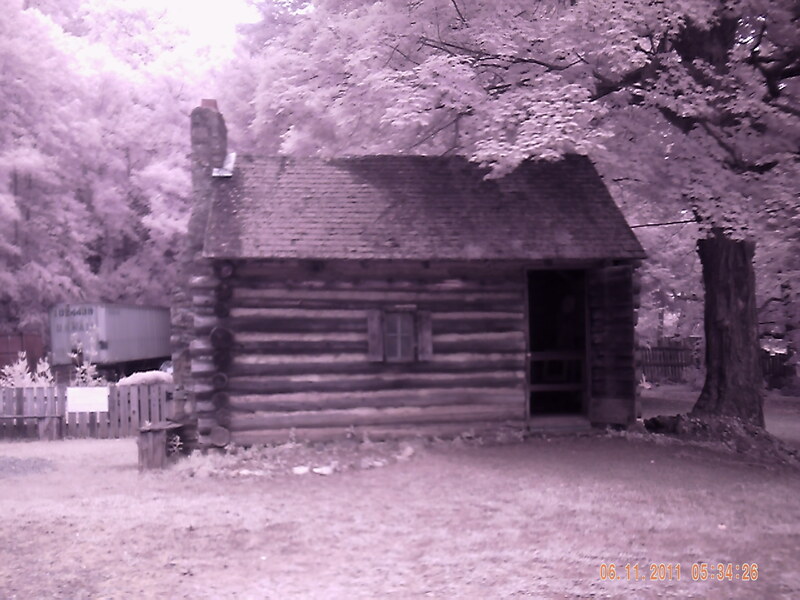 THIS IS A REPLICA OF THE CABIN WHERE DANIEL MORGAN WAS BORN, NOT FAR FROM HERE IN HUNTERDON COUNTY. HE IS A WAR HERO, AND LATER A REPRESENTATIVE TO CONGRESS FROM VIRGINIA, WHERE HE LIVED LATER IN LIFE. THE CABIN IN NOT VERY BIG AT ALL, BUT IT GIVES EVERY IMPRESSION THAT YOU ARE IN A REAL LOG CABIN FROM THE 1700'S. INSIDE IS A BED THAT MOST OF US WOULD BE ASHAMED TO GIVE TO OUR WORST GUEST! THEY SLEPT SITTING UP BACK THEN SO THIS BED IS VERY SHORT! NOT GOOD IF YOU ARE TALL. Daniel Morgan was a great man in history and I was very keen to see if we could contact him, so I had sent me usual ghost ecto-mail asking for him to talk to us. Lo and behold, when we got to the cabin, both Doug and I felt uneasy. As we took pictures of the bed and the inside, I decided to try to do an EVP session real quick. When i asked the General which victory he enjoyed more, Saratoga or The Cowpens(see our page on Daniel Morgan), he replied with his answer, which was not what I had initially thought. Saratoga, yes Saratoga. In fact, Daniel Morgan is related to Henry Morgan, the pirate. But this guys deeds were just as brave and made a huge impact on the war. We are all forever in his debt as one of the greatest battlefield tacticians of history. SO i was very honored that he spoke to us, and he seemed to know what we were all about. I explained that we were there to help get the story out of Daniel Morgan. Someone replys, can I say for sure it is Daniel Morgan, no, but he seemed to respond to my questions and I even tested him by asking the date he was made Brigadier General. His response is unclear at this time, but I will let you know if he gets it right. So it is my opinion that we got to speak to Daniel Morgan and I feel very honored to have done so. When I told him I was from Pennsylvania, a place he had moved to when he left home in New Jersey, you can hear him say something like "I lived in Pennsylvania". I was having a conversation with the man who led a group of Virginia Sharpshooters called Morgan's Rifles during the early stages of the revolutionary war. He and his men were well known to the British for their tactic of picking off the officers first. Colonel Banastre Tarleton, the bad guy from the Patriot, never forgave Morgan for this and was sent to hunt him down like a dog. General Morgan instead gives him the beating of his life, and he barely escapes capture. Morgan's use of the Double Envelopment tactic was the most successfully executed in modern warfare and his tactics are taught at West Point today. This is the store or tenant house. It was actually a tenant house for many years and two families would have shared it. Today, it is presented as an old General Store, which is just great to see! It even has a small Post Office area, like they would have had. My hometown of Elmhurst PA, had a general store like this with a Post Office attached for years, up to about when I was 12 or so. It closed due to super markets and convient stores that opened. This tenant house, or the store as we would call it, would give up some great evidence and Doug set up his camera and laser grid up inside, while I ran a audio recorder for the post office window. Upon review, we both heard what sounds like someone walking back and forth upstairs. Then they appear to come down the stairs(which are blocked off mind you) and walk into the room, walk around for awhile. Then someone turns Dougs camera nitevision switch to day and then back again to night!!!! Honestly, that is what happened. This is during the "lockdown" period where we are all in the new office bldg eating pizza. While we were in the store, Rich's wife and daughter Olivia, came in and Olivia wound up being the key to talking to this girl spirit, who was about the same age as she was, we would later find out. I started using the dowsing rods, but gave them quickly to Olivia, and they started moving! We got answers to questions and we would wind up finding out her name, Sila, and her last name, Van Camp. After more questions, we asked her if she went to school at the schoolhouse, next to the store and she said yes! So thinking quickly, we moved to the School House, where this girl seemed the most comfortable, and go more answers. Then the PX box starting chiming in and we had several people come to talk to us before we ended our investigation. THIS IS A SHACK WHERE PEG LEG VAN CAMP, THE GRAVEDIGGER, AMONG OTHER THINGS, LIVED. THE STORY GOES HE WOULD DIG A GRAVE THAT NIGHT, LAY DOWN IN IT AND GO TO SLEEP AND IN THE MORNING, GET UP AND GO BACK HOME TO HIS SHACK. IMMEDIATELY WHEN I STUCK MY HEAD INSIDE, MY CAMERA WENT OUT OF FOCUSE AND I KNEW MR PEG LEG WAS HOME! I LEFT A RECORDER AND SAID LET ME KNOW IF ANYONE NEEDS HELP AND WALKED AWAY. LISTEN TO JUST A FEW OF WHAT I GOT IN THERE. WE WANT TO THANK BRUCE PEARSON, AND THE BOARD OF DIRECTORS FOR THE RED MILL MUSEUM, FOR ALLOWING US TO INVESTIGATE THIS GREAT HISTORIC SITE THAT MADE SUCH AN IMPACT ON NOT ONLY LOCAL HISTORY BUT THE WOLRD, BEING ONE OF THE FIRST TOWNS WITH ELECTRIC LIGHT IN THE COUNTRY. SPECIAL THANKS TO JOHN AND RICH, RICH'S WIFE AND DAUGHTER OLIVIA, WHO JOINED US LATER IN THE EVENING AND HELPED US TALK TO THE SPIRIT OF A GIRL NAMED SILA VAN CAMP. SHE WOULD LATER LEAD US TO THE SCHOOLHOUSE AND EVEN SHOW US HER PICTURE ON THE WALL AND POINT TO HER DESK! THIS YOUNG SPIRIT ENJOYED TALKING TO US AND HAD FUN WITH OLIVIA, BEING AROUND THE SAME AGE. I LET OLIVIA HOLD THE DOWSING RODS IN THE TENANT HOUSE AND THEY RESPONDED QUICKLY. THIS IS A SPECIAL PLACE, WHERE MYSTERY AWAITS AROUND EVERY CORNER AND EACH OBJECT HOLDS SIGNIFICANCE. OUR NIGHT WOULD TURN OUT TO BE VERY INTERESTING AS WE WOULD START TO PUT A PUZZLE TOGETHER. A MURDER MYSTERY RIGHT OUT OF HISTORY, WAS UNFOLDING, AND DETAILS OF PAST ACCIDENTS WOULD COME TO LIGHT. 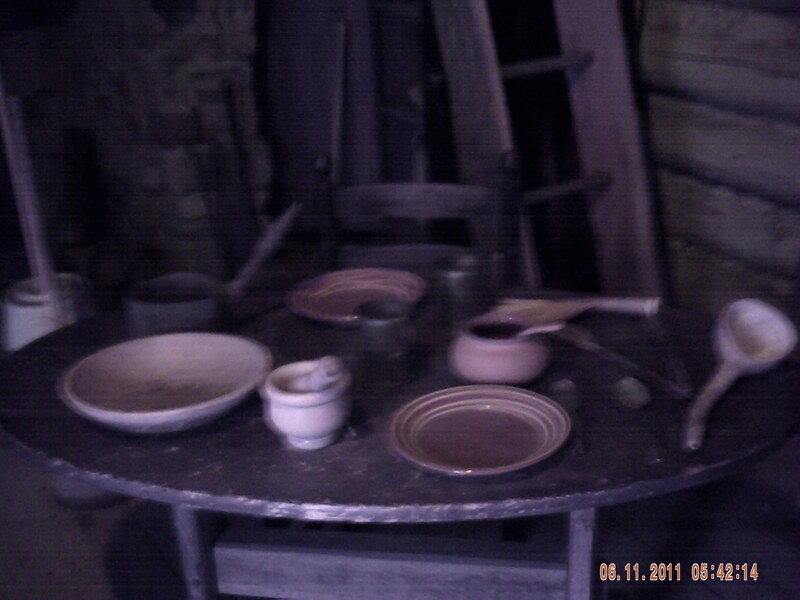 Doug took this photo of the interior of PegLeg VanCamp's shack. At first I could not understand why the end of the bed was dark. Notice the shadow at the foot of the bed. If this was Doug's shadow, it would extend over the bed and floor toward the door or toward the camera, yet there is no shadow from Doug. I had several minutes of conversation from 2 people in the shack that night on my digital audio recorder and you can hear some of those evps on this page! I can say that there is no reason for that shadow to be there and it seems diffuse around the edges but almost opaque in the middle. It just makes no sense and leaving all other options behind, it just might be old Peg Leg himself! The inner workings of the Mill are immense! The woodwork and gears are amazing and huge! It is hard to imagine how they were able to do what they did with the tools they had back then. A lot of things here are made of wood and done by hand. If you could go back in time and watch this place in action it would be an exciting place indeed! SUPPORT YOUR LOCAL COAST GUARD AND COAST GUARD RESERVE!!! !